It's a good practice for hospitality business owners to consider the range of different guests they serve, and to try to think of the best ways to make everyone comfortable. Do your guests have allergies? Children? Perhaps they have limited vision and travel with a service animal. There are a range of different circumstances your business should be prepared to handle. One of the questions we get quite often is, "How do I make wheelchair accessible tables?" With that in mind, this post is an overview of the Americans with Disabilities Act, which provides guidelines (actually, hard and fast rules) for how restauranteurs should accommodate guest's using wheelchairs, to make sure they can enjoy your hospitality in comfort. The Americans with Disabilities Act is a Federal civil rights law that prohibits the exclusion of people with disabilities from everyday activities, such as buying an item at the store, watching a movie in a theater or enjoying a meal at a restaurant. The law established requirements for private businesses of all sizes. Much like laws that prevent discrimination based on other factors, the Americans with Disabilities Act is intended to level the playing field, and ensure that everyone is included. 5% of dining, banquet and bar tables (or at least one if you have fewer than 20 tables) must be wheel chair accessible. If you have a bar area in your restaurant, those are counted separately, but in the same way. If you have fewer than 20 seats at the bar, at least one area must be accessible for persons using wheelchairs. That's important to note, as you not only have to remove a stool, but the bar surface must be no higher than 34" in that area, which is quite a bit shorter than standard bar height (consult with your contractor to ensure you bar is compliant). What exactly is an ADA compliant table? An accessible table has a surface height of no more than 34" and no less than 28" above the floor. At least 27" of knee clearance (29" is preferable to serve persons using larger electric wheelchairs) must be provided between the floor and the underside of the table. An accessible route (36" wide even with people seated at tables) provides access to each accessible table and a clear floor area 30" x 48" is provided at each accessible seating location. This floor area extends 19" under the table to provide leg and knee clearance. 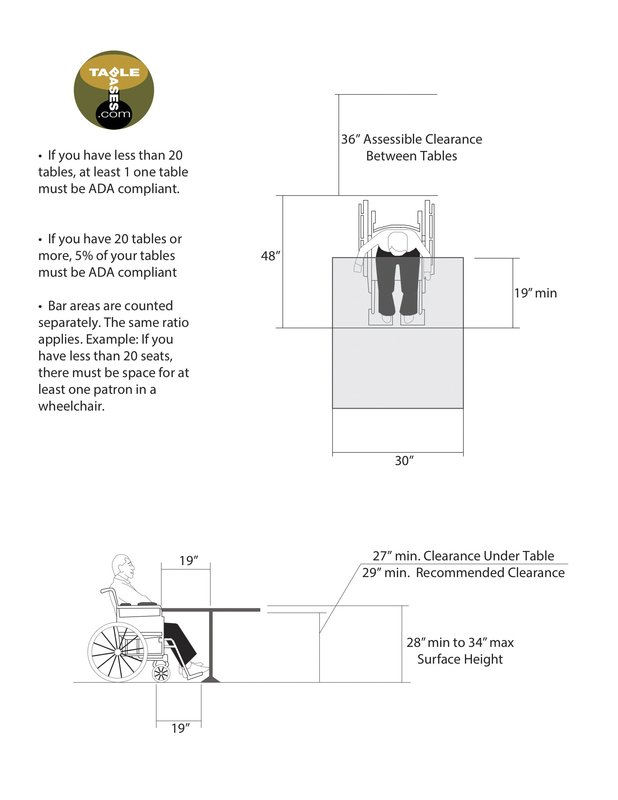 With all those measurements flying around, it can be difficult to grasp what an ADA table looks like in reality, which is why we've created the handy diagrams shown above and below. Certain types of table bases are better suited for ADA purposes than others. T-Style table bases, Bolt Down table bases and Cantilever Style table bases are the best options, as they have minimal footprints, and allow you to be compliant without using very large table tops. Cantilever table bases are a great option, as they do not take up any space on the floor, leaving the underside of the table free. With a cantilever table base, you could use a 20" x 30" table mounted on the wall, and it would be ADA compliant (though only able to seat one person). Make sure to mount your cantilever so that the underside of the table will be at least 29" above the floor. We recommend consulting with your contractor to ensure your wall will be strong enough to support your table top. 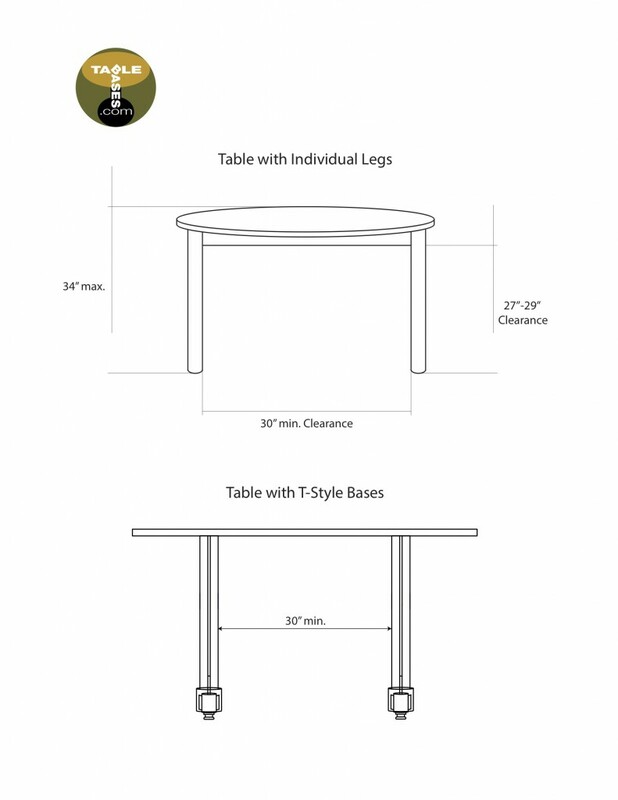 T-Style bases are another great option, they are easy to install and take up minimal space (see second diagram, below). All you need is a table base that is at least 27" tall (29" recommended), and ensure your table top is at least 20" deep, and wide enough to leave 30" between the two T-Style table bases (for example, a 19" wide by 40" long by 29" tall table top would be the minimum table top size you could use with our B22T ADA). Bolt down bases secure into your floor, and as such do not need a large, heavy pedestal or long bar at the base. These bases have minimal footprints, ranging from about 7" to 11" in diameter. They are a little tricker than Cantilever or T-Style bases, because you have to ensure that there is at least 19" between the edge of the table, and the edge of the bottom of the bolt down table base. Bolt down bases work well when you do not want to have a table against a wall (i.e. with a cantilever base), and want to be able to switch between using chairs, or making space for wheelchair accessibility. For example, a 48" diameter table top with our P2F Black Bolt Down table base would be ADA compliant. Your tables are not the only area that may need some reworking to make sure that people using wheelchairs have comfortable access. Staircases, restrooms and parking areas are all challenging areas that need to be constructed with everyone in mind. The more accessible your business, the more potential customers you can serve. Feel free to download the diagram shown below for your reference. Be sure to consult with your local regulators, as well as your contractor or project manager, to ensure that you're plans are considerate of all your customer's needs.